One reason to reach for whole grains at breakfast is because they tend to have higher lean protein counts than refined grains and processed products. Steel-cut oats, with their earthy flavor and nutty texture, are no exception. In fact, a single serving of oats provides nearly as much protein as a full glass of milk. One dry quarter-cup of steel cut oats weighs about 45 grams and cooks up to approximately 1 cup of hot, prepared cereal when combined with water. A single serving of the cereal has about 170 calories, 3 grams of fat, 29 grams of carbohydrates, 5 grams of fiber, 7 grams of protein and no cholesterol, sodium or sugar. In contrast, 1 cup of low-fat milk has 120 calories and 8 grams of protein. Protein is an essential nutrient for your body’s growth, strength and development. Vegetarians and vegans in particular may have difficulty getting enough daily protein, and regularly eating non-dairy foods that are rich in the nutrient, such as steel cut oats, can help. Women should get 10 to 35 percent of your daily calories from protein, or about 46 grams per day. In addition to generating energy for the body, protein builds and repairs cells and tissues and helps you develop lean muscle mass. Nutritionally, steel cut oats are equivalent to rolled oats, quick oats and instant oats, all of which are whole grain varieties. The difference lies in processing. Rolled oats are steamed, flattened and occasionally toasted, so they have a softer texture and a more rapid cooking time. 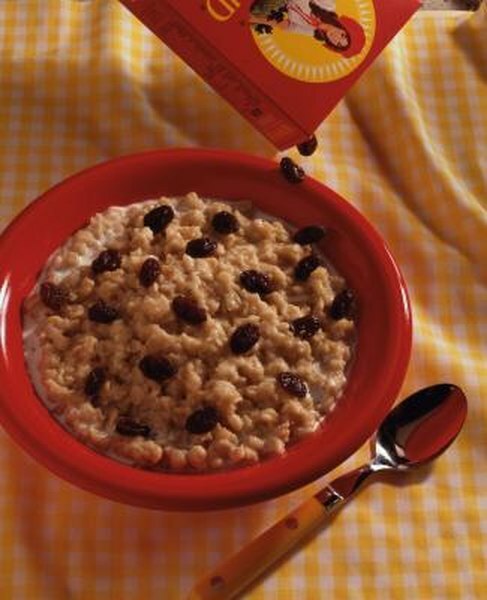 Steel cut oats are oat groats that machines have cut into two or three pieces, but they undergo no further processing. That gives them a nutty taste and texture and means they require a longer cooking time, sometimes up to 40 minutes or more. It’s easy to boost the total protein content of your oatmeal by adding a few nutritious accompaniments. For example, if you make your oats with 1 1/4 cups of milk instead of water and serve them with a medium banana, you can add 11.5 grams of protein to your meal. You can also try mixing 1/4 cup of wheat germ into your cereal, which will add about 6.5 grams of protein, or stirring in one 30-gram scoop of protein powder, which could add 20 grams of protein or more.